Together with an international team, Senckenberg scientists examined the diet of the extinct Giant Sloth Megatherium. Based on analyses of the collagen in the fossil bones, the researchers concluded in their study, which was recently published in the scientific journal “ScienceDirect,” that Megatherium subsisted on an exclusively vegetarian diet. Until recently, there had been much speculation about the food habits of these elephant-sized, ground-dwelling animals. Sloths may well rank among the world’s most peculiar animals: With their backs pointing downward, they hang in trees and move in slow motion from branch to branch with the aid of their sickle-shaped claws. “Sloths already occurred 10,000 years ago, for example the species Megatherium,” explains Professor Dr. Hervé Bocherens of the Senckenberg Center for Human Evolution and Palaeoenvironment at the University of Tübingen. The extinct relatives of the sloths could reach the size of an elephant and were much too heavy to spend a significant amount of time in the trees. Instead, they lived on the ground, where they excavated large burrows. For many years, their dietary habits were an enigma; the long claws on their hands and feet, in particular, gave rise to various speculations. Did the sloths use their claws to dig up subterranean insect colonies? Did the long claws serve as hunting tools, and were the giant animals carnivores? Or did the fossil representatives live on a strictly vegetarian diet, like the recent sloths? “These questions were at the center of our new study,” adds Bocherens. In carnivores, the proportion of proteins is significantly higher than in herbivores, which primarily eat food high in carbohydrates. These differences can be documented in the isotopes. In order to reinforce their results, the scientists compared their data with more than 200 bones from modern mammals, whose diet is known, as well as with fossil specimens from both carnivores and herbivores. “Our results show that by using this method, it is possible to reconstruct the feeding habits of animals even several thousand years after their death,” adds the biogeologist from Tübingen. Knowledge of the sloths’ feeding habits is important in order to understand their role in past ecosystems. 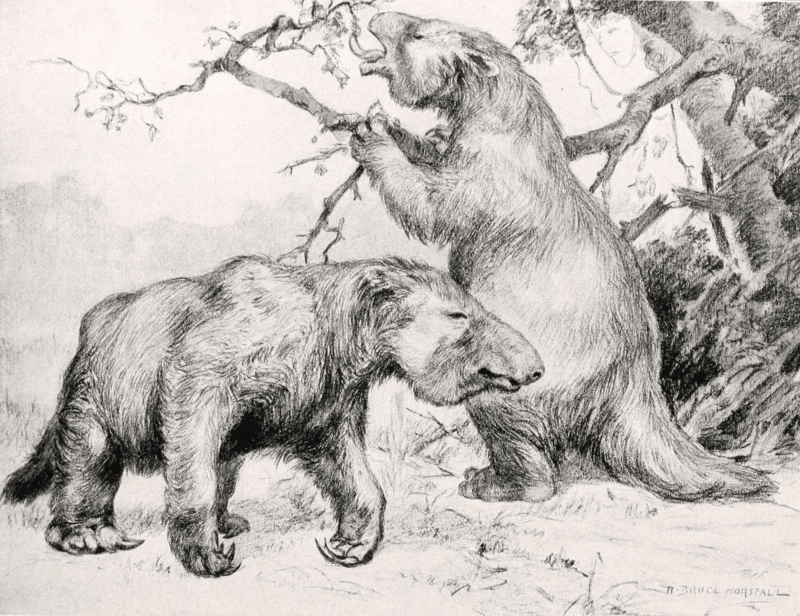 “Moreover, the results can help us understand the interactions between Megatherium and the first human inhabitants of America – their habitats overlapped for several thousand years, before the Giant Sloth became extinct,” offers Bocherens as a preview.